Music licensing laws have been screwed up for a long time now... on the order of decades. So many people get their flat fees when an album is recorded, pressed, and sold. The mixing, mastering, and recording engineers, the record executives, the marketing team, video directors and editors... even the roadies on tour are on salaries. So why is it that the songwriters and recording artists end up carrying most of the risk? Sure, there's advances and allowances but the artist pays that back before collecting profit. And these days, with Youtube and Spotify, who's really buying the albums? The Recording Industry Association of America even had to redefine what going Gold and Platinum means to accommodate all the streaming (and not buying) going on these days. Some of the top selling artists are putting albums out for free online with nearly zero promotion (think Kanye West and Eminem). It's almost as if there's very little point in trying to sell albums any more. It's like we've always said, "Get the show money." Get a hit, go on tour, sell merchandise, earn ticket sales, and save aggressively. Well... the Music Modernization Act is looking to change these archaic licensing laws and royalty fees. Blame it on lobbying, blame it on out of touch politicians, who knows. There's been decades of effort trying to amend outdated laws related to licensing music. The industry in the United States alone cleared $8.7 billion in revenue in 2017. There's tons of cash flowing around but artists are seeing little of it if you aren't one of the few chosen to be in the lime light. The industry is big enough to support almost 2 million American jobs. The problem started with the ability to copy cassette tapes and progressed on to burning CDRs at your PC in your bedroom. Napster came and went, and now we have Youtube, Spotify, and Pandora taking a lion's share of the music streams, eating into hard sales. Everyone's getting paid handsomely except the artists relying on royalties. Even with royalties, ASCAP, BMI, and SESAC get paid first and then the rest is trickled out to artists. Currently, artists in the U.S. are protected by Reproduction and Distribution copyrights, which guarantees a minimum of $0.091 per reproduction of a song. So a sale of a 10 track album nets the artist $0.91, whether that's on compact disc or through a digital download. Now divide that by 5 band members and remember that they have to pay off expenses and advances first. That's with sales. With streams the story is much more grim. Past (generous) estimates by Billboard for companies like Pandora associate around a $0.32 cents of revenue with each stream of a song. Pandora themselves take a $0.165 cent cut (51.6%). Then SoundExchange / PRO keeps $0.0059 cents and an additional $0.0007 cents for administrative fees. The remainder keeps getting chopped up until by the end the record label receives $0.0026 cents and the songwriters and artists share the final $0.0026. An unnamed artist shared their payment statements from several sources in 2013. He owns 40% of the song with his bandmates sharing the other 60%. Pandora played their song 1,159,000 times in one quarter of the year, netting him a total of $16.89. Youtube played his song 152,900 times, netting him an amazing $12.05 in profit. Contrast this with radio plays which are regulated currently. Sirius XM played the song 179 times and paid him $181.94. An FM/AM radio station played his song 18,797 times, earning him $1,373.78. That's a bit more like it. ...have all passed unanimously in the House Judiciary (32 - 0 vote) and then the House of Representatives (415 - 0), yet nothing ever happened. Fast forward to June 28, 2018 and the Senate Judiciary Committee has passed the Music Modernization Act unanimously again. The goal is to close loopholes related to music licensing and bring these laws out of the "stone age" (we follow laws created before World War 1 still) in order to ensure the millions of artists in the country are receiving fair compensation for the enjoyment of their creative endeavors. To do this a formal body will be created that is administered by music publishers to handle the new intricacies of mechanical licensing. This body will act as a go-between between streaming platforms and publishers and artists. It will provide a limited liability for these streaming platforms while also allowing better royalty rate negotiation with them. Believe it or not, one senator believes the CLASSICS aspect of the bill is an unfair extension of copyright law (the part that wants to make sure older artists get paid for their hits that are still relevant). 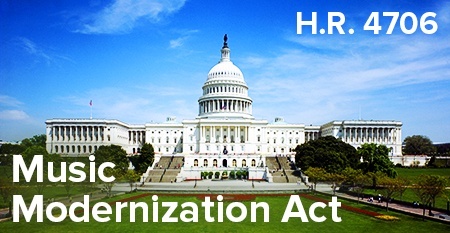 This Democrat senator from Oregon, Ron Wyden, has introduced the Accessiblity for Curators, Creators, Educators, Scholars, and Society to Recordings Act (ACCESS) as an attempt to derail the progression of the work being done with the Music Modernization Act (MMA). Grammy believes his bill is "a misleading, alternate bill that threatens to distract from the MMA's progress." Regardless, the bill will now move to the desk of President Trump, where he will either veto the bill and send it back for more consideration or it will be signed into law. Our current president is very pro-worker, so the chances are extremely high, especially with the full unanimous support of Congress, that we will finally enter into a modern era of paying artists fairly on the internet. Beyonce's Drummer Quits & Files Restraining Order Over "Extreme Witchcraft"